My Little Stamping Corner: It's Challenge Time! This time of year is filled with weddings and I'm loving making white-on-white cards. Today I used my new Rose Creations Spellbinders Dies. I think they turned out pretty. The card base is white with a white Textile embossed panel on top. Beautiful white lacy ribbon was wrapped around the embossed piece. A small silver foil 4" doily was gently placed on top. This little doily is so fragile and will show the least bit of bending or tearing. Luckily, mine turned out perfect. A Nestie circle was cut and embossed and placed over the center. Three different sized roses were layered with dimensionals in between them. I curled up the petals a little. A large rhinestone was placed in the center. Before placing the rose down, I punched several white leaves and taped them around the bottom of the circle, then I added the completed rose on another dimensional to the center. These cards are identical except for the last part where I used a double butterfly on one and a double dove on the other. The top was attached only to the center of the bottom butterfly or dove so I could raise the wings for a three-dimension look. The butterfly was adorned with tiny graduating pearls and the dove can now see with its tiny rhinestone eye. I rarely make two cards alike but had two weddings to do and I loved how the first one turned out so I duplicated it for the other that I needed. I enjoyed making and sharing them with you. Stamps: PTI Big & Bold Wishes (inside) "Mr. & Mrs."
This is beautiful! I love the silver doily and the leaves. Stunning card! Thanks for playing along with us at Frosted Designs! This is a lovely card, Robbie. I really love white on white and your card is perfect! 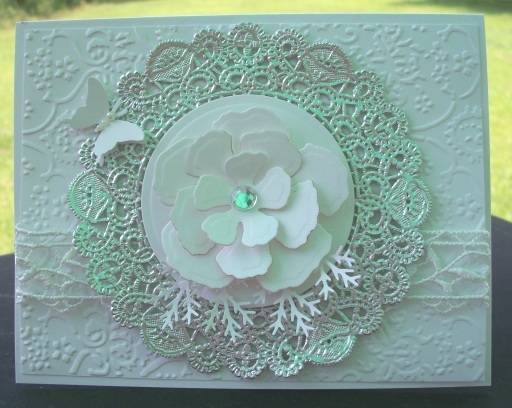 The doily against the embossed background is a perfect combination! Thank you so much for joining us at Hooked on Craft! Very elegant! Love the added embossing and doily behind your blossom! Thanks for playing along with the Bloggers Challenge! This card is just stunning. Thanks for joining us at Frosted Designs. 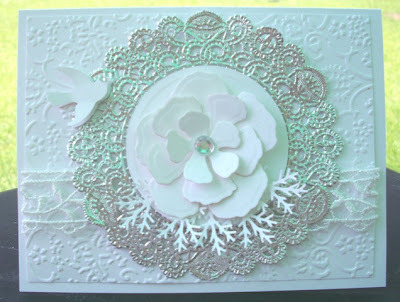 Very elegent flower/card. Thanks so much for joining us at CCC. Hugs and Good Luck! the white on white flowers are gorgeous. Thanks for joining us at blogger's challenge this week! So pretty and elegant. Thanks for joining the BC Floral Frenzy challenge. Very pristine and elegant...love the combo of whites. Thanks for joining us over at CCC, good luck. Thanks for joining us at Hooked on Craft Challenges.